Truth is, when it comes to experiencing success with raw food preparation, the proper tools make all the difference. Let’s look at the primary, mandatory tools used in the modern kitchen that support raw food enthusiasts and help them create delicious, tempting dishes without the need of an oven. Blender: Powerful, high speed blenders along with food processors may be the most important kitchen appliance for the raw food enthusiast. Because of demand, there has been an explosion of these kinds of machines which in turn has helped to drop the price, allowing more individuals to cash in and take advantage of this new healthy raw food trend. Raw whole juices are just one of the healthy items you can churn out using this tool. You’ll enjoy smoother, more refined juices, sauces and smoothies. Food Processor: This tool is perfect for shredded vegetables, creating raw food plates and raw food desserts. You can create crackers, cookies, and breads using a high powered food processor. They come in every price range and even offer a mini-size that’s perfect for one or two people. The better ones come equipped with slicing and grating attachments so don’t be afraid to experiment. Dehydrator: Like the high speed blender, this is a must have in any raw food enthusiast’s kitchen. Perfect for hydrating fresh fruits and vegetables, granola’s and seed crackers. They also work to heat food just enough to soften the texture and are perfect for creating different tastes. The best buys are the ones that come equipped with non-stick pads that lay over the mesh trays. 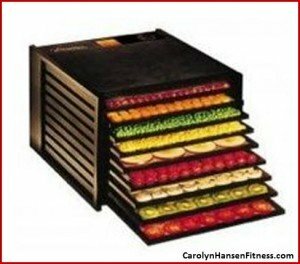 This makes dehydrating easy and quick to clean up. Spice Grinder: Seeds such as flax seed are common ingredients for raw food enthusiasts but these little seed wonders do not release their goodness to us unless ground up first and the spice grinder does the job perfectly. Additionally, fresh spices are a very important ingredient in raw foods and a spice grinder is the perfect tool to grind up and make use of these food enhancing flavors that also offer a wealth of antioxidants. Mandolin and or Spiralizer: These kitchen tools turn vegetables such as Zucchini into long curly noodles, fancy garnishes, and salad toppings. The benefits are obvious…they get more fresh veggies into our bodies. Opt for one that offers different size pasta settings such as spaghetti or angel hair. You can also employ the spiralizer to create thin ravioli wrappers from sliced vegetables such as beets. You are only limited to your own imagination with this machine. Juicer: Creating delicious juice from the variety of veggies that Mother Earth has provided us requires power also. Make sure to choose a juicer that offers different speeds and is super easy with clean up. If it’s hard to clean up after you are done you’ll likely be reluctant to use it in the future. One last thing to keep in mind is the quality of the machines you are purchasing. Bear in mind that if you are switching over to a total raw food diet that your blender (and other appliances) will get lots of work daily. You’d be wise to purchase the most powerful machine you can from the get-go to experience the best results with pureeing your fruits and veggies. Not only will it do a better job for you but you won’t have to replace it very couple of years like you would with a cheaper model. Leave the cheaper models on the table and opt for one that has a long warranty such as 7 or 8 years. If budget is a concern for you, there are options such as Amazon or Ebay. Look for a nearly new “used” machine or one that has been reconditioned that still comes with a warranty. In this new day and age of the Internet there is truly something available for everyone’s budget. Now that we have your kitchen properly equipped for raw food success it’s time make use of them by getting as many healthy, nutrient rich vegetables into your diet as possible and that includes dessert.